As one of the leading suppliers of conveyor modules with proven build quality and reliability, we are proud to present a range of expandable, flexible and durable conveyors for loose loading and unloading applications. Loose loading eliminates ‘dead space’ created by pallets or roll-cages. 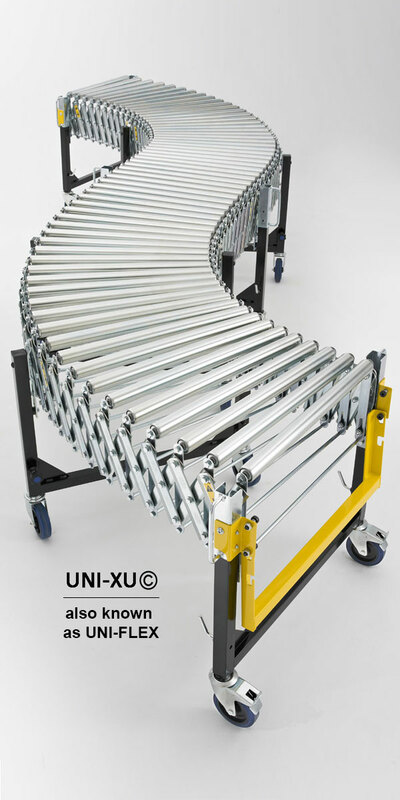 Engineered to the highest standards to endure the rigorous demands of despatch areas, distribution centres and parcel handling hubs around the world, our flexible conveyors provide cost effective handling solutions – not only for the large distribution centres but also for smaller companies requiring only single units. 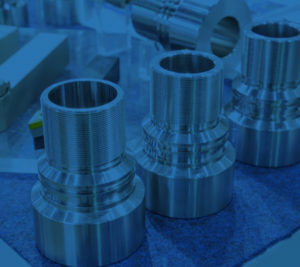 Our products are used by blue-chip companies in the UK and throughout Europe and are solely manufactured in the UK. 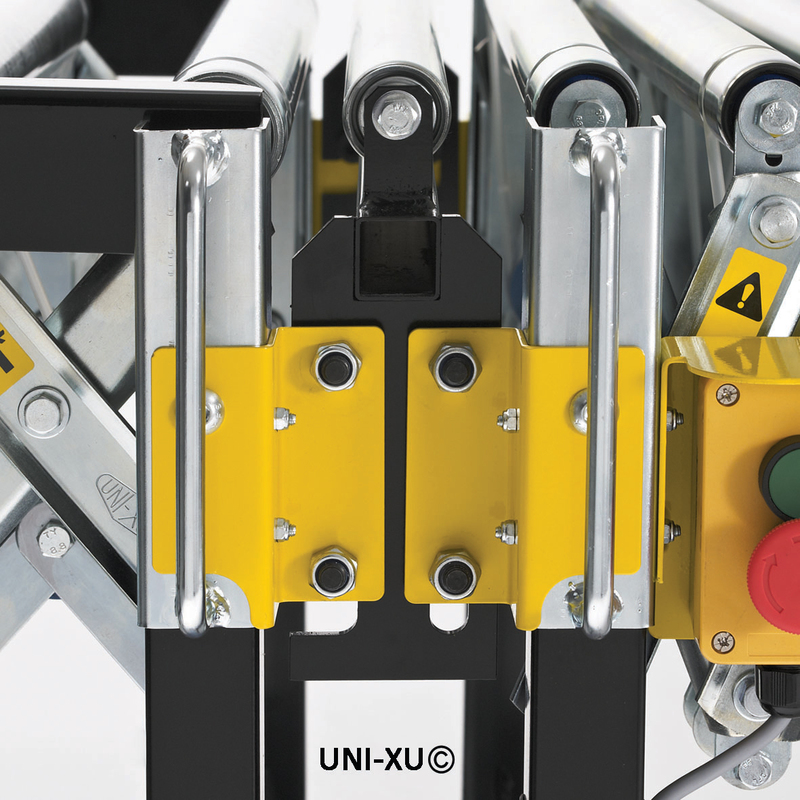 Positive grip points for safe and easy manoeuvring of the conveyor. Fully bolted design without rivets. Roller retaining tag washers. Structural support across width with lower fixed axles. Heavy duty square tubing leg frames with bracing. 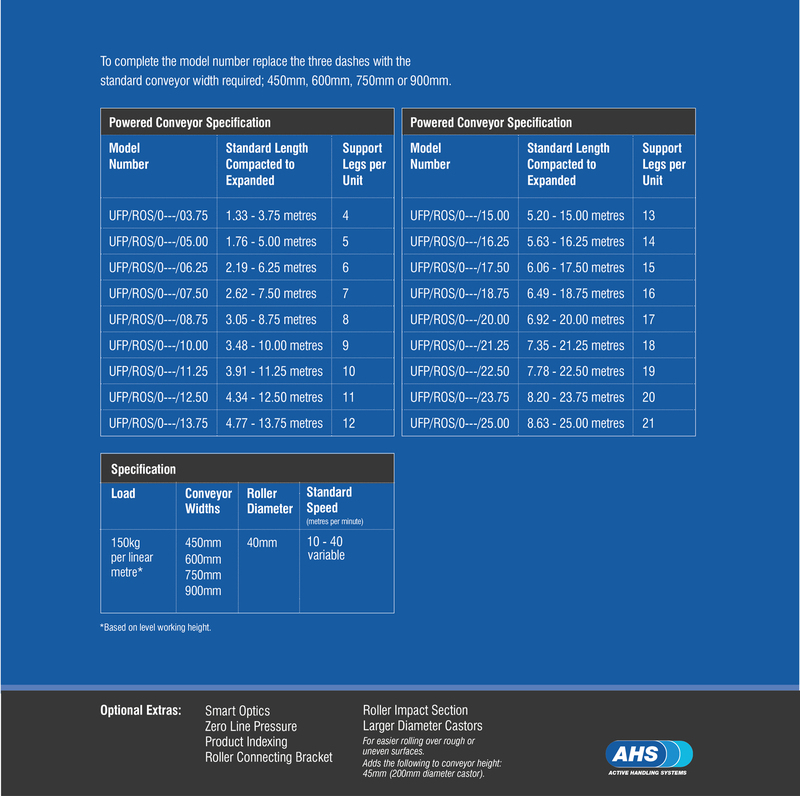 A European Patent is held for the following parts across its Flexible Converyor range, making the range both unique and superior. Perfect for vehicle loading and unloading, parcel distribution centres, machine-to-machine linking and all cross docking applications. 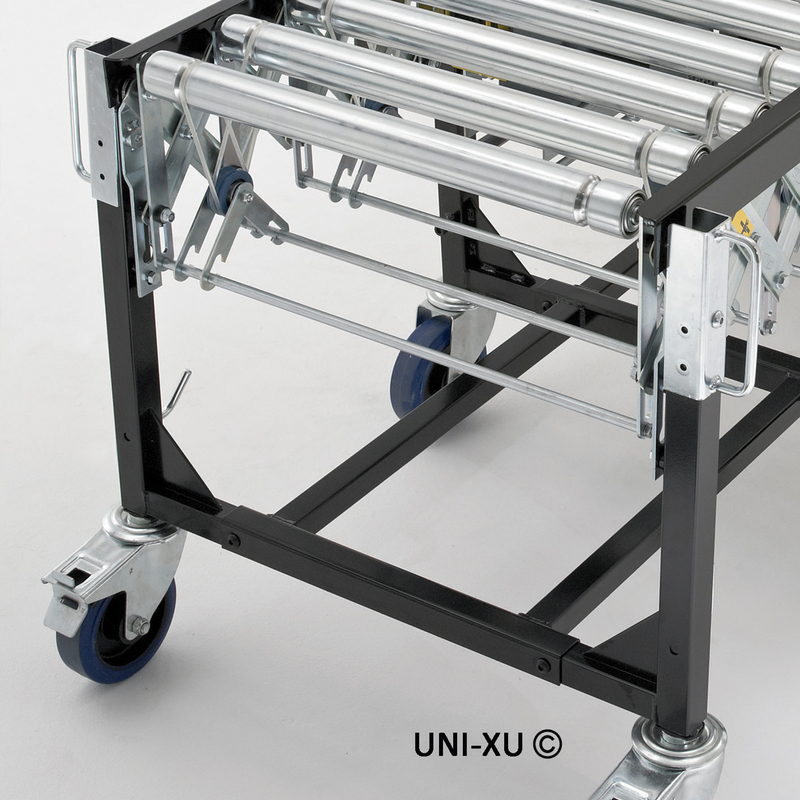 Can be easily moved in or out of trucks for faster, safer, easier loading and unloading. 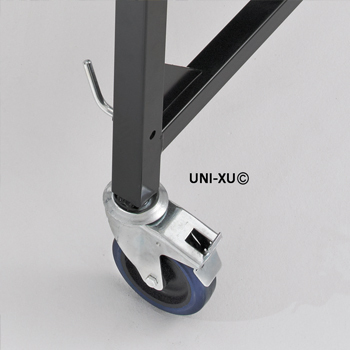 Combination of braked and non-braked, heavy duty swivel castors – 160mm diameter x 50mm. 125mm as standard when the conveyor is fully extended. Optional 75mm and 100mm roller centres can be supplied for the conveying of smaller packages or cartons. 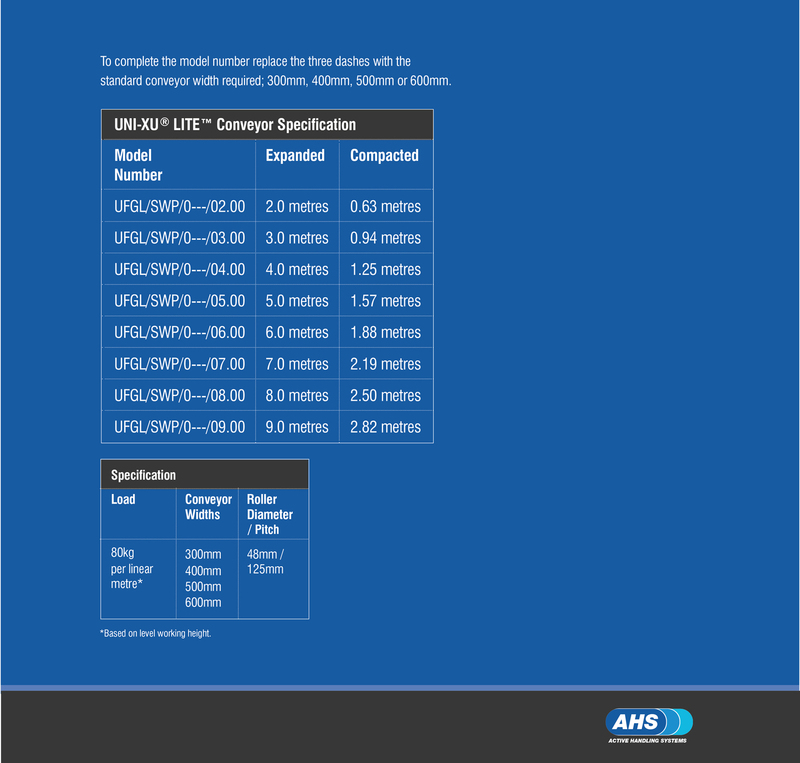 Please note that optional roller centres will affect the conveyor compacted length. 40mm diameter, steel zinc plated tube with precision bearings. Rollers are driven from heavy duty polyurethane drive belts. Cartons follow twist of conveyor. No need for engineered curves. 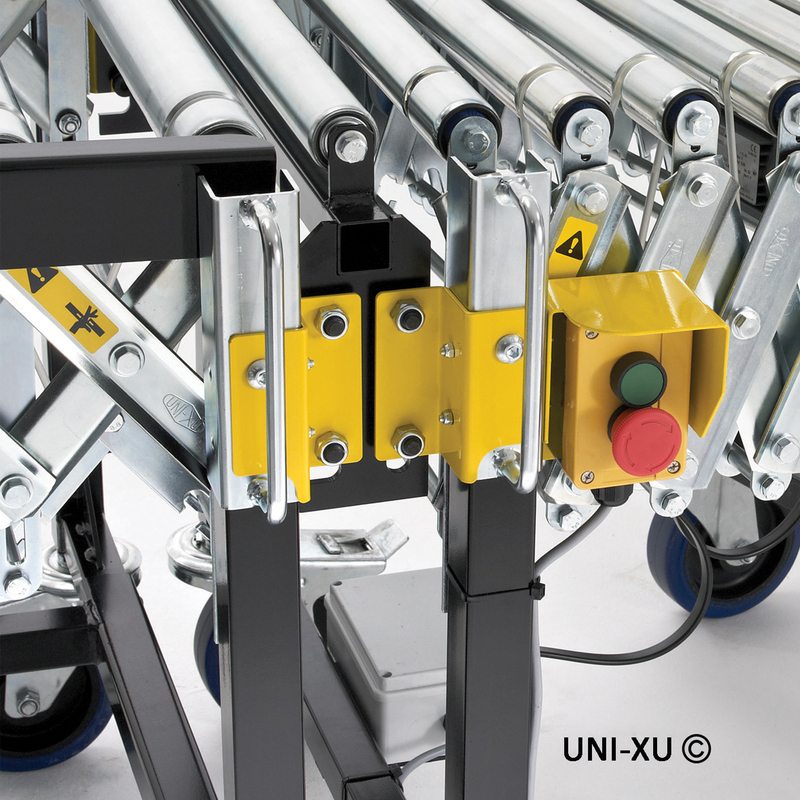 Allows you to quickly and easily connect two or more conveyors together to expand your system. Improves impact loading by fitting of 50mm x 3mm wall rollers with 4mm roller mounting bracket. Additional support stand at mid point of 1.25m length. Rigid and flexible options available. 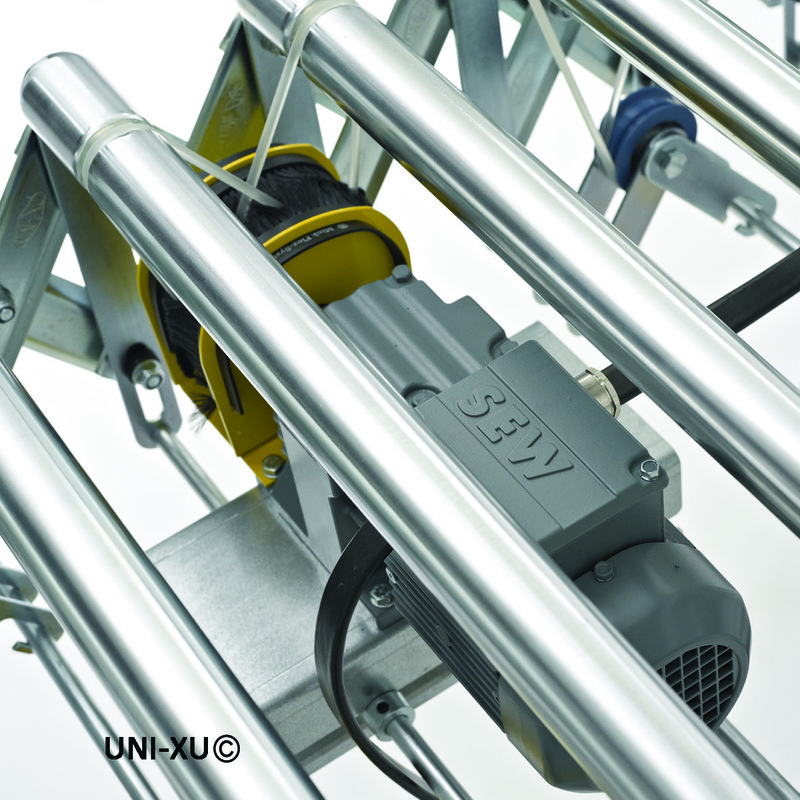 Fully adjustable conveyor speed from 10 to 40 metres per minute; 0.09kw for 230V / 240V single phase. Low maintenance – no brushes. Smart optic sensors act as an electronic package stop. When a package is detected by the sensor it automatically stops the complete conveyor. The stop has an adjustable time delay which can be set by the operator. When the package is removed the conveyor will start automatically. Supplied with shielded, flat form cable which maintains correct cable routing. All steel electrical control cabinets, housing a top specification AC inverter with keypad, sealed to IP55 standard and mounted on a lockable sliding tray. Enables easy user access for any adjustments or maintenance. CE Compliant. Start/stop switch at both ends for safety. Isolator switch included. Perfect for conveying different sized boxes with irregular bases or bags etc. 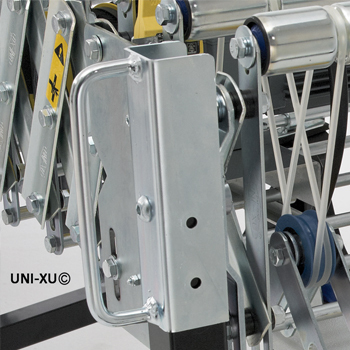 Very easy to quickly manoeuvre in or out of trucks for faster, safer, easier loading and unloading. Fully adjustable conveyor speed from 10 to 40 metres per minute; 0.09kw for 230V/240V single phase. Low maintenance – no brushes. 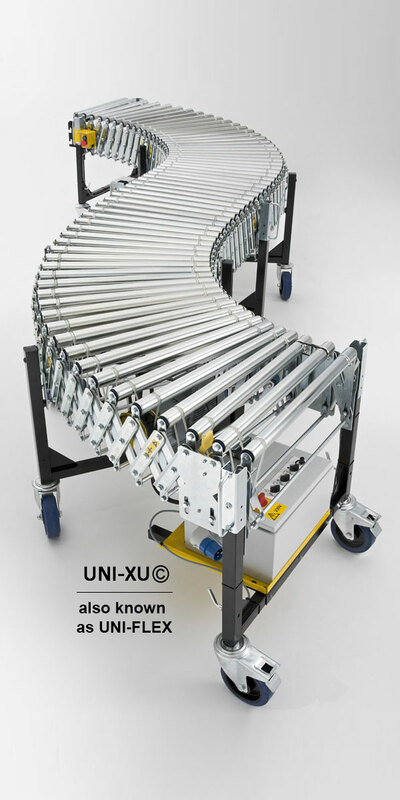 A rugged conveyor ideally suited for many roles from packaging and flexible assembly lines to loading and unloading of trucks and containers. 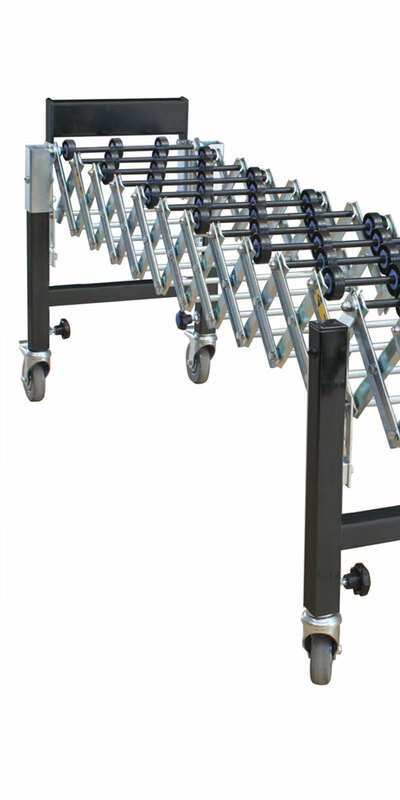 The conveyor is easy to move around on heavy duty castors and simply compacts to a quarter of its size when not in use. Combination of braked and non-braked, heavy duty swivel castors, 125mm x 36mm. Prevents product damage by stopping cartons and packages from falling off the conveyor at the discharge end. 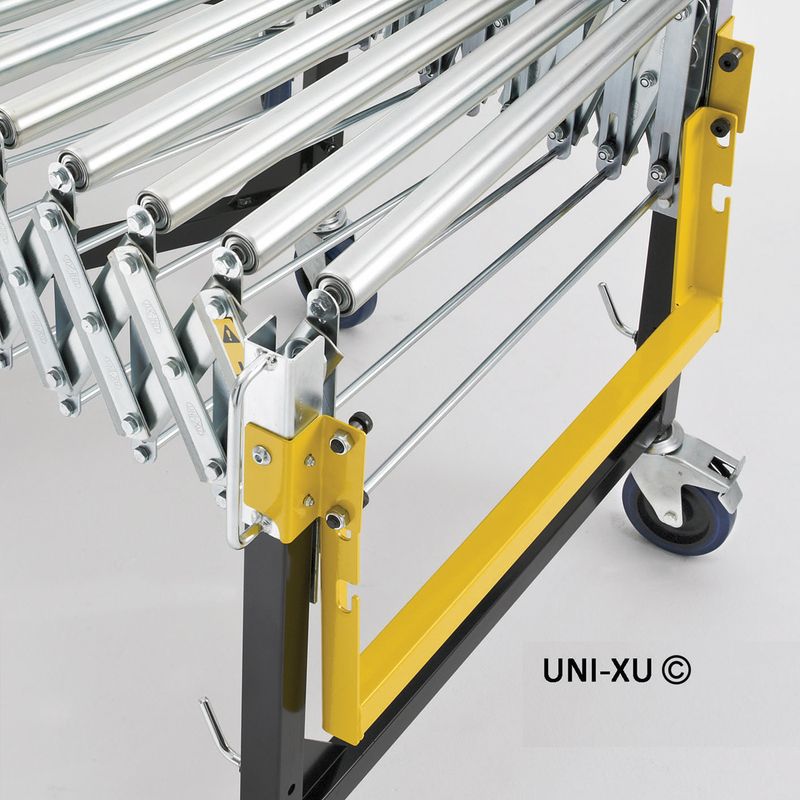 Simply drops down for storage when not required or when connecting to another flexible conveyor. These provide a top of skatewheel working height from 750mm to 1040mm as standard. Other heights available on request. 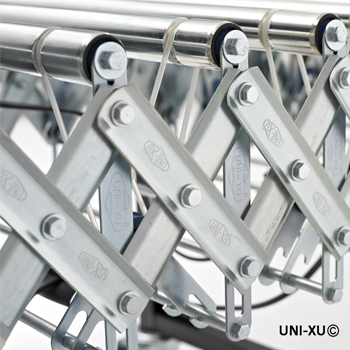 The flexible standard – 49mm diameter, heavy duty zinc plated and suitable for all flat based loads. 48mm diameter plastic skatewheel also available for lighter applications. 125mm as standard when the conveyor is fully extended. Optional 75mm and 100mm roller centres can be supplied for the conveying of smaller packages or cartons. 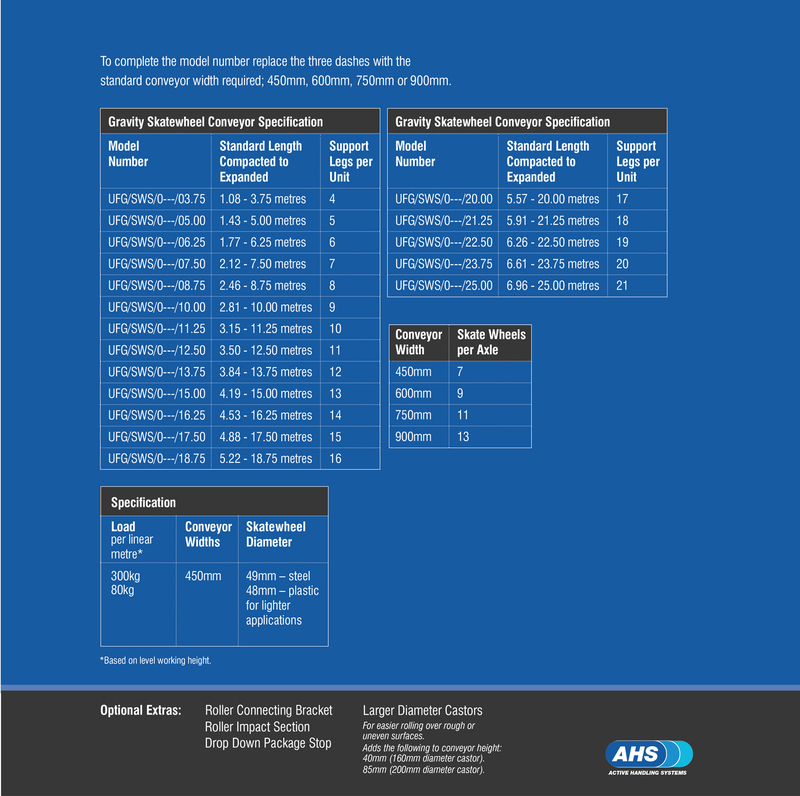 Please note that optional skatewheel centres will affect the conveyor compacted length. 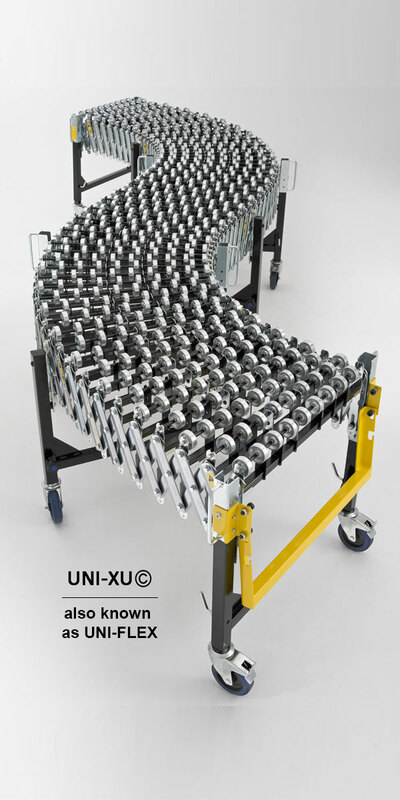 For the ultimate in flexibility, specify the LITE™ range of expandable gravity conveyors. 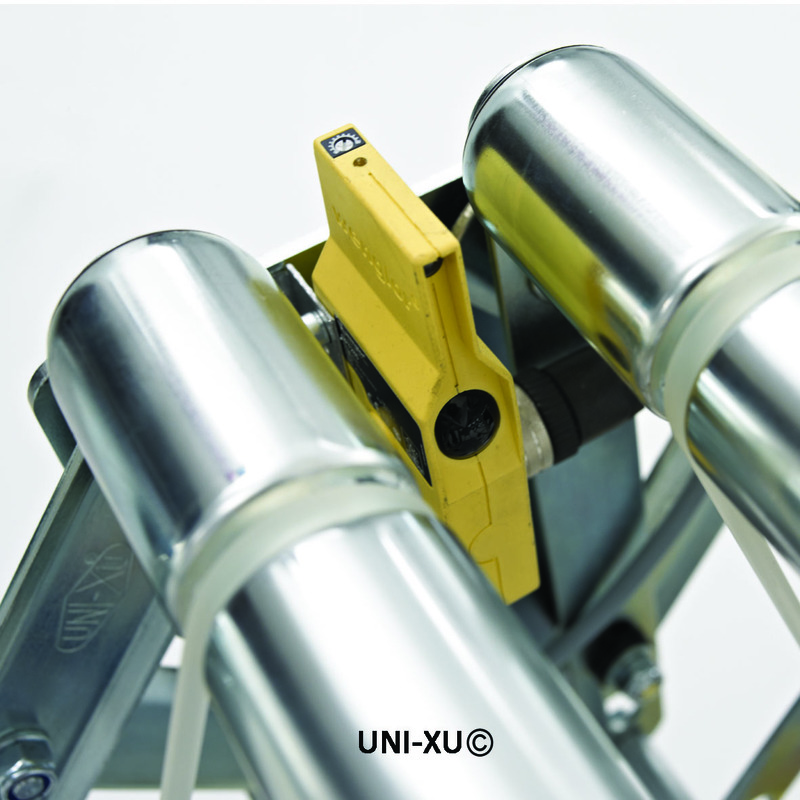 Perfect for ‘end of line’ packaging applications or wherever flexibility and portability is demanded. Virtually any shape of conveyor design can be achieved with this system, from the very tight inside radius curves; to a full 360° complete circle. Reinforced, ribbed zinc plated steel side plates. Structural support across width with heavy duty square tubing leg frame. Fully bolted design without rivets. All steel skatewheel axle support – ‘one-piece’ and ‘constantly vertical’ – ensures maximum strength throughout. Jig welded and spanning the conveyor width. 580mm to 865mm as standard, with 100mm castors. 125mm as standard when conveyor is fully extended. 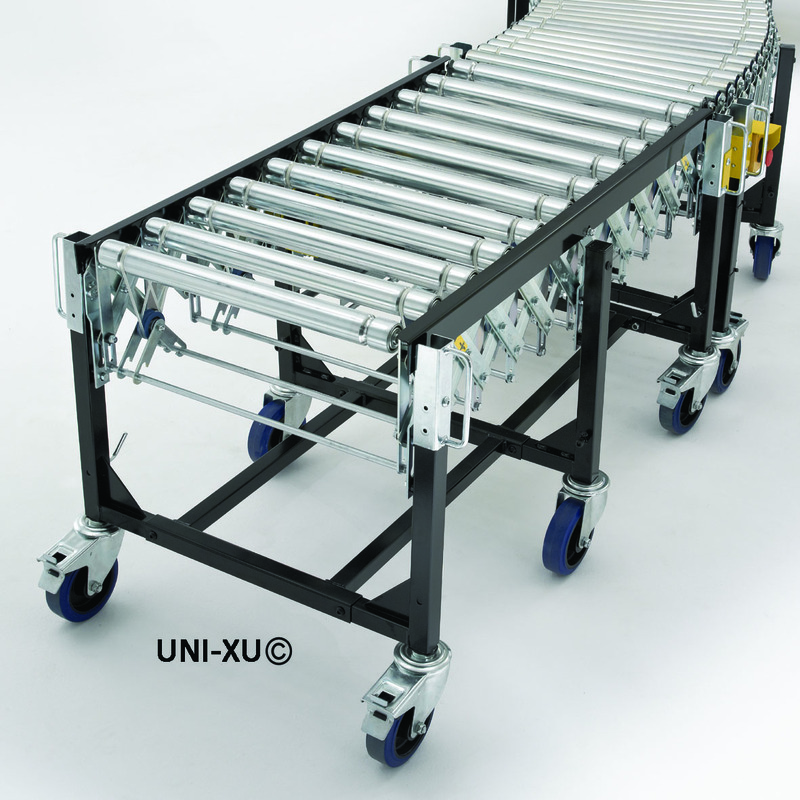 The UNI-XU® modular range of conveyors has been integral to thousands of turnkey solutions for some of the most demanding and successful blue-chip companies across Europe.